McCarthy and Eisenhower, Nelson, Lucey, and Proxmire--they were all giants of state and national politics in the 1950s. Yet the period also produced Walter J. Kohler, Jr., a three-term governor who, in the words of the Milwaukee Journal, was the most dominant force in Wisconsin politics of his era. In this highly readable biography personalities and events of the 1950s are discussed, as are some of the issues that still divide contemporary Democrats and Republicans in the twenty-first century. 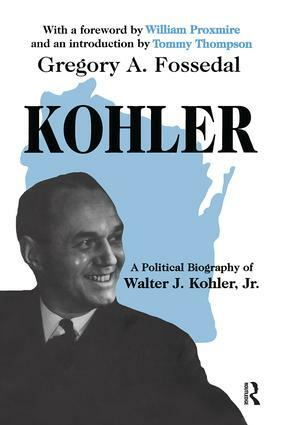 Walter Kohler was one of two men to gather 1 million votes for governor in Wisconsin through the end of the twentieth century. He is credited with helping create the Eisenhower presidency, both by his support in Wisconsin's critical presidential primary, and by organizing the nation's Republican governors to endorse Ike in the run-up to the 1952 GOP Convention. He signed the largest income tax cut, in percentage-rate terms, at any level of government between Coolidge and Kennedy. He fought for a vast expansion of Wisconsin's highway system, and in 1952 launched what became a national crusade for traffic safety. He paved the way for coordination of Wisconsin's now-unified university system; took the battle for civil rights to Wisconsin's shipping, hotel, manufacturing, and other industries, and became the first governor in two decades to fulfill his constitutional duty to enact a reapportionment of the state legislature. Fossedal also captures Kohler as political anti-hero.In an age when Americans long for self-governance by our political and corporate officials, Kohler's integrity as a man may be as arresting as his acts as governor.